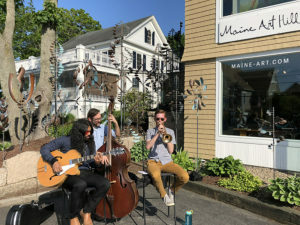 Kennebunkport and Kennebunk celebrate their flourishing art scene with a 2nd Friday Village Art Walk, with over 20 cool studios, galleries and artists in the Kennebunks – and you can visit them all in a fun social circuit on the Art Trail of the Kennebunks. 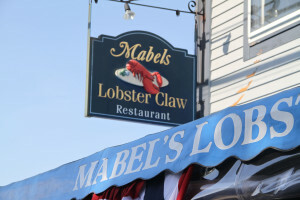 Its like Portland Maine’s 1st Friday Art Walk, only better – ’cause its in Kennebunkport! Kennebunkport has become a fantastic art vacation destination…we call it KennebunkArt! Village Art Walk of Kennebunk and Kennebunkport occurs the second Friday of the month, starting during the Kennebunkport Festival June 8, 2018, July 13, August 10, September 7, and December 7 during Kennebunkport’s Christmas Prelude. The Village Art Walk is a free self-guided walking tour, and its fun. 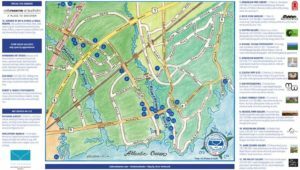 Walk from art studios to galleries in Kennebunk’s Lower Village and Kennebunkport’s Dock Square and out Ocean Avenue, and in to downtown Kennebunk from 5 to 7 p.m. Art Trail of Kennebunks Maps are available at the galleries, the Kennebunks’ Chamber of Commerce and online. Admission is free and the Village Art Walk is open to everyone- art lovers, aficionados and newbies, thanks the galleries and sponsors – the Historic Inns of Kennebunkport – Captain Lord Mansion, Maine Stay Inn, Captain Jefferds Inn, 1802 House and The Inn at English Meadows, plus restaurants Old Vines Wine Bar, Hurricane, Salt & Honey, Pedros, and HB Provisions. The Village Art Walk encompasses Maine Art & Maine Art Hill, The Gallery, The Grand, and The Studios including Phosart. 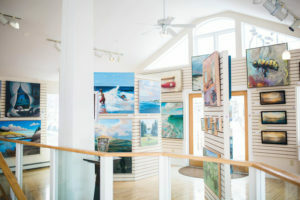 More galleries in Kennebunk include River Tree Center for the Arts, Morph, Blue Whale Trading Company, Sue Rioux Designs, Of The Sea and Sea Light Candle Co., and in Kennebunkport – Art Guild of the Kennebunks, the W. Robert Paine Gallery, Rusty Fly Gallery, True North Gallery and Landmark Gallery, The Port Gallery, Chris Becker Gallery, and Mast Cove Gallery. In downtown Kennebunk art galleries you can visit are The Brick Store Museum, Kennebunk Free Library, Meadowlark Designs, and Wade Zahares outside of town in Lyman. Maine Art Hill alone makes a fabulous block art walk any day of the week. Maine Art Hill on the corner of Chase Hill and Western Ave is home to 9 art galleries in 4 unique art destinations—The Gallery, Shows, The Grand and Studios. The Gallery is open year-round and is one of Southern Maine’s premier art gallery destinations representing over 40 fine artists. Each artist has some connection to Maine whether they are from here, live here currently or are lucky enough to spend time here when they can. Several artists are known nationally and even worldwide. Shows are located in a historic home at 5 Chase Hill offering an intimate gallery setting for viewing original artwork. The Grand features new works from select artists from The Gallery. Studios is a collection of six micro galleries representing high-quality artists and artisans. The Works, a three dimensional gallery, Pop-Up, a weekly surprise of local talent, Thompson and Company Fine Art, Maine Art Hill Prints and Maine Art Hill Framing, and PhosArt Fine Art. So be sure to visit Kennebunkport and Kennebunk on the 2nd Friday evening of the month to peruse these fantastic galleries, meet the artists and collectors, and then go for drinks and dinner at one of Kennebunk’s great places- like Old Vines Wine Bar, or Alison’s in Dock Square, Striper’s or Mabel’s on Ocean Ave across from Christopher Becker’s photography gallery. See more on the top art galleries and studios in Kennebunk, Kennebunkport and Cape Porpoise! See more on Kennebunk and Kennebunkport’s art galleries and the best restaurants in the Kennebunks, and where to stay when visiting the Kennebunks.